The visual system of a newborn takes time to develop. Although infants are born with all of the eye structures needed to see, they need to learn how to use them together. 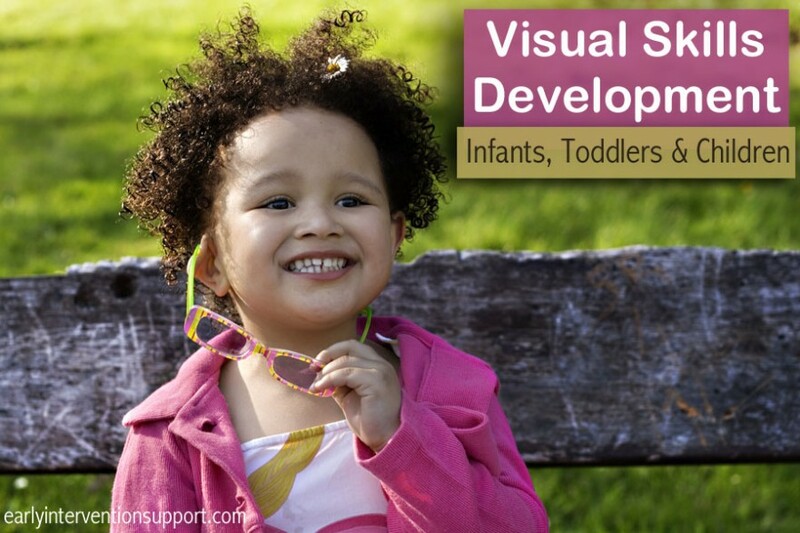 Infants will spend much of their early months developing visual skills such as focusing, eye teaming, eye movements, depth perception, and eye-hand coordination. The following visual abilities listed suggest typical visual development. However, these are estimates. You may find that your child has developed some of these skills at an earlier time than noted, and others may develop later. The sequence of skill development may vary among some children. A physician will examine your newborn’s eyes at birth to rule out congenital cataracts and other serious problems. At this time an antibiotic will be put on the eyes to prevent infection from bacteria that was present in the birth canal. Read more! At this time infants should be following slowly moving objects intermittently to midline. When taking photos, you will begin to notice your baby blinking at the flash. Visual acuity is still in the 20/200 to 20/400 range. Read more! It is thought that infants have good color vision by 5 months of age, although, not as sensitive as an adult’s. Read more! You may start noticing your child visually responding to smiles and voices of others, moving his or her eyes around the room to see what is happening, and creeping after a favorite toy when seen. Read more! At 1 year of age visual acuity is in the 20/50 range. Eye-hand coordination and depth perception are continuing to develop, and by 2 years of age they should be well developed. Read more! By 2 years of age children should have 20/20 (normal) vision. You may notice that they are becoming increasing more interested in exploring their environment. Read more! By 3 years of age the eye is almost grown to its adult size. A 3 year old is using his or her vision to coordinate fine motor activities and make judgments about them. These visual motor skills include coloring a simple picture, copying simple marks or shapes, and tracing simple shapes and objects. Read more! At this age children are refining their visual motor skills. This is demonstrated by their ability to color within the lines, cut between lines and on a broad line, and cutting out simple outline pictures. Read more! Visual development includes optical abilities, motor skills, discrimination, visual closure (ability to complete an incomplete image), sequencing, visual memory, imagery, and figure-ground perception (ability to notice a target against the background).